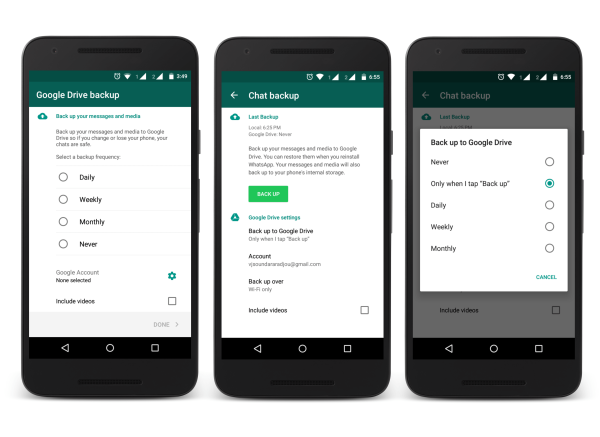 Earlier in Android, WhatsApp lets you Backup chats only in your device storage. There was a problem with this method — When you lose your mobile device, the chats are gone permanently. So, the solution is to safely Backup everything in the Cloud. Now, WhatsApp lets you do this. You can safely Backup your Whatsapp chats, photos, videos and voice messages to Google Drive privately in Android and can restore them easily if you have lost your device or bought a new device. Head to WhatsApp for Android download page. Select “Download Now” to save APK file to your device. The size of the file is 23.1MB for Version 2.12.339 (If you are downloading in mobile device, it will display a warning. Press “OK” to skip the warning and download the file). If you have downloaded the APK file to your computer, connect the mobile device to your computer with the USB cable and transfer the APK file to your mobile device. If you have directly saved it to your mobile device, then the process becomes much easy. Before you proceed to update the App, you need to allow access to update the App. To enable this, go to Settings > Security > Toggle on the Unknown sources (It will display a warning, skip it and select “OK”). Next, go to the location where you have saved the APK file with the file browser and select it. Click “Install” to update the App in the pop-up displayed. You need to select the frequency of the Backup — “Daily” or “Weekly” or “Monthly”. Then, select the Google account in which you wish to Backup. WhatsApp will ask you to grant permission to access Google Drive. To do this, select “ALLOW” in the permission pop-up. You may or may not include videos in your Backup by using the check-box. Then, select “Done”. You can change the above settings at any time by going to WhatsApp Settings > Chats and Calls > Chat Backup. You can manually Backup here by selecting “BACKUP” (You can also change the frequency of Backup here by selecting “Only when I tap Back Up”) and also specify whether to Backup only in WiFi or both WiFi and Cellular by going here. Uninstall and Reinstall WhatsApp or Install the WhatsApp in case you use a new device. After you verify your number, you will be prompted to restore Backup from Google Drive. Click on the gear icon located at the top-left corner and Select the “Manage Apps” tab. Scroll down until you find WhatsApp Messenger. You can see how much Hidden app data after it loads. To delete the App data, click on “Options”, then select “Delete hidden app data” and select “Delete” in the pop-up. 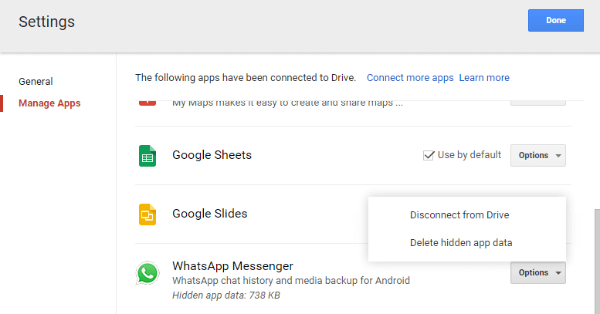 Delete WhatsApp Google Drive Backup by selecting “Delete hidden app data”. To stop future Backing up to Google Drive, you can select “Disconnect from Drive” option.